1. What early role did Philadelphia play in the fight for human rights? 2. When was Philadelphia the capital of the United States? Philadelphia was the nation's first capital between 1790 and 1800. 3. What historic locomotive was first used in Philadelphia? The "John Bull" which was shipped from England for use in the United States in 1831. In 1981 it was operated for the last time, making it the oldest operating locomotive in the world. Today it is on display at the Smithsonian Institution in Washington, DC. Source: "John Bull locomotive, 1831." Smithsonian Institute. 2001. 4. When was the first recorded regatta on the Schuylkill River? The Schuylkill, which is one of the most famous sculling areas in the United States today, staged its first regatta in 1835. 5. What is the early history of Rittenhouse Square in Philadelphia? At first called Southwest Square, it was used for hunting pigeons and for grazing cattle and pigs. During the Civil War it was a parade ground for the military. 6. When are the origins of Philadelphia International Airport? It started as the S. Davis Wilson Airport which was used during World War II. It opened in its enlarged form in 1954 and was continually enlarged throughout the through out the sixties, with air traffic up by 800 percent by 1970. Source: Philadelphia; A 300-Year History. Edited by Russell F. Weigley. New York : W.W. Norton, 1982. Pg. 696. 974.811 P53WE. See also Philadelphia International Airport. 7. When did a system of public schools begin in Philadelphia? It began in 1818, with classes in reading, writing, arithmetic, and needlework for the girls. About 3,000 indigent boys and girls attended during the first year. By 1836 a child of any income level could attend. 8. What was the original Native American name for the site where Philadelphia was founded? The original site was a camp called Coaquannock by the Lenni Lenapes, the Native American tribe indigenous to the area. It means "the grove of tall pines." 9. In what city was the first Women's Declaration of Rights unveiled? Susan B. Anthony presented it in 1876 in Philadelphia. In order to call attention to it, she led a march of various suffrage organizations to the Centennial Exhibition, which was being held at the same time. 10. In what city was the first national convention of the Republican political party held? They held it in Philadelphia in 1856 at the Musical Fund Hall. There the Republicans nominated John Fremont and adopted a party platform. 11. When was the first public reading of the Declaration of Independence? 12. Who was it that first suggested that the United States Mint be built in Philadelphia? Robert Morris, head of the Finance Department of the federal government, proposed to Congress on January 15, 1782 that the United States Mint be built in Philadelphia. The cornerstone was laid on July 31, 1792, and the construction was completed on September 7. 13. Where along the Pennypack Creek did George Washington camp during the Revolutionary War? General George Washington encamped on the upper Pennypack near the Pennypack Mill during the winter of 1777. 14. Where did the United States first make coins? The first coins made by the United States Mint in Philadelphia were one-cent and half-cent copper coins. They were authorized by Congress on April 2, 1792 and delivered to the treasurer in 1793. 15. In 1884, what Northern city had the largest African American population? That would be Philadelphia. By 1890 the African American community had grown to 40,000. 16. When was Chinatown in Philadelphia first settled by Chinese Americans? Chinatown, which runs from Vine to Arch between 9th and 11th Streets, was occupied after 1870 by Chinese Americans who'd initially immigrated to America to build this nation's railroads. 17. What is one of the worst epidemics suffered by the people of Philadelphia? In 1793 there was a terrifying Yellow Fever epidemic which killed over 5,000 people. Many fled the city, including George Washington who lived in the Deshler-Morris House in Germantown during that time. 18. Who was the first mayor of Philadelphia? The first mayor of Philadelphia was Humphrey Morrey who held the office when William Penn erected the Town and Borough of Philadelphia into a City by his charter of 1691. It is unknown how long he remained Mayor; however, it is not unlikely he held the office until 1701. 19. When was the first recorded unofficial Mummer's Parade in Philadelphia? The first Mummers parade was January 1, 1876 when various groups formed their own individual Mummers Parade to Independence Hall. In 1901 forty-two clubs were granted permits to parade on Broad Street for money prizes approved by City Council. 20. Who was Philadelphia's first female judge? Hazel Hemphill Brown was a Municipal Court judge from 1952 until 1974. She died Dec. 12, 1983. 21. What is the Gunboat Philadelphia? It is the only surviving American-built gunboat used during the Revolutionary War. It is now a National Historic Landmark and is housed in the Smithsonian Institution. Source: "Continental Gunboat Philadelphia." Historic Naval Ships Association. 2004. 22. What is the origin of the Franklin Institute? The Institute was founded in 1824 to provide a place for the study of scientific endeavors. In 1934 it moved from its original location on Market Street to its present site, at 20th and the Benjamin Franklin Parkway on Logan Square. Source: Morgan, George. The City of Firsts. Historical Publication Society in Philadelphia, 1926. pg. 207. 974.81 M82. See also Franklin Institute. 23. What is MOVE? What happened in Philadelphia on May 13, 1985? MOVE was an organization formed in Philadelphia in 1972 that advocated an anti-technology, back-to-nature lifestyle. Occupying houses in South and West Philadelphia, the group received complaints from neighbors leading to increasingly violent confrontations with police. On August 8th, 1978 a police officer, James Ramp, was killed during a dispute. In 1985 after a violent shootout Mayor W. Wilson Goode ordered a bomb to be dropped on the MOVE house. The fire that resulted was let to burn and killed 11 people and destroyed 62 homes. Philadelphia has since paid over $32 million dollars to the victims and their families. Source: Anderson, John and Hilary Hevenor. Burning Down The House; MOVE and The Tragedy of Philadelphia. New York: Norton, 1987. 24. What is believed to be the worst fire in Philadelphia's history? The single worst fire was the July 1850 blaze in the Water Street area. By the time the blaze was brought under control, it had taken 28 lives and destroyed 367 buildings. 25. What was the first library in Philadelphia? The first library was a gift of 200 books made to Philadelphia's Anglican congregation by Maryland Bishop Thomas Bray in 1698. 26. When was Philadelphia the primary port for immigrants coming to America? 27. How did Quakerism affect the social order in colonial Philadelphia? The Quakers believed in equality for all people and worked to prevent human suffering. Philadelphia's public schools taught girls as well as boys. The public almshouses served the poor of all faiths. Quakers lent immigrants money without interest and protested the slave trade. Source: Bronner, Edwin B. "Village into Town, 1701-1746." Philadelphia: A 300-Year History. New York: Norton, 1982. p. 43-45. 28. In the late 18th century, what language other than English, was spoken by almost half the population of Philadelphia? 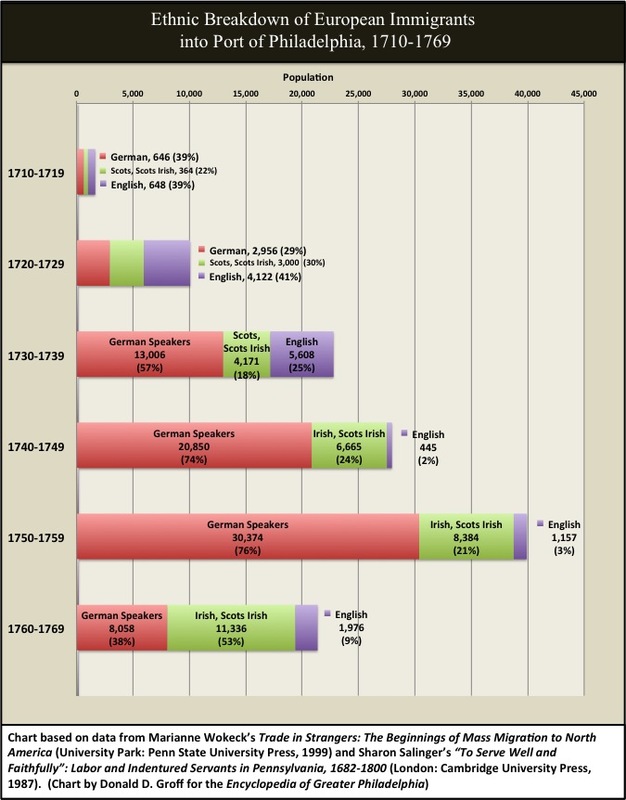 German was spoken due to the large number of German immigrants that moved to Philadelphia in the 18th century. 29. Where and when did William Penn first arrive in Philadelphia? 30. What happened during the siege of Fort Mifflin in 1777, when 12,000 British troops fought an American garrison of 400? Fort Mifflin was captured by the British, and the fort was basically destroyed. Under the cover of night 300 men and several military stores crossed safely to Fort Mercer. 40 men remained to cover the evacuation and to burn anything that could be of service to the enemy. Approximately 70 common soldiers died in the attack. 31. What is the oldest horticultural society in the United States? The Pennsylvania Horticultural Society is the oldest horticultural society in the United States. It was organized in November of 1827 at the Franklin Institute which was then located at 7th Street off Market Street. 32. Where in Philadelphia is a Tomb to the Unknown Soldier of the Revolutionary War? The cemetery originated as the first public cemetery in 1706 called Potter's Field for burial of the poor, but later it became known as Washington Square. Many soldiers from the Revolutionary War were buried there in unmarked graves. A tomb to the unknown soldier of the American Revolution was dedicated in 1957. It includes a statue of Washington facing a sarcophagus with a limestone backdrop. 33. What cemetery in Philadelphia was declared a National Historic Landmark? Laurel Hill Cemetery, located at 3822 Ridge Avenue in Philadelphia, was place on the National Register of Historic Places and designated a National Historic Landmark on August 5, 1998 thanks to the work of the Friends of the Laurel Hill Cemetery. The first American rural cemetery was founded in Cambridge, MA in 1831, and shortly after John Jay Smith and a group of investors wanted Philadelphia to have the second rural cemetery in America. They acquired land about four miles north of Philadelphia overlooking the Schuylkil River. In 1836 the group organized the Laurel Hill Cemetery Company, and John Notman was the designer of the cemetery. The Laurel Hill Cemetery now covers 95 acres. Source: Philadelphia Graveyards and Cemeteries, 2003, p.21-23, Thomas H. Keels, 974.802 K248P, See also the National Historic Landmarks website. 34. Where was the Liberty Bell originally meant to be hung?